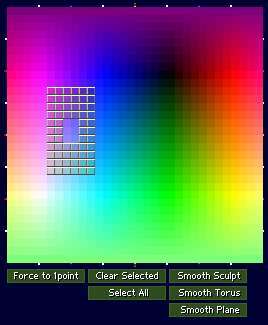 Manipulate 1 or multiply of individual points in the sculpt. Scale on X/Y/Z towards 0,0,0 or the current selected points. Translate the point(s) selected on X/Y/Z. In version 0.92 its possible to rotate points as well, change the stepsize of scaling and rotating. You can scale/rotate around 0,0,0 or the points that are currently selected. Note: To scale/rotate around the selected points does not check if Symmetry is on or off yet. It just will look at the selected points currently, calculates the middle of the selected points, and scale/rotate around that point. Clears or select all; the points. Smooth's the current sculpt towards a torus plane/ shape. It becomes easy to (un)select a number of points the same time. I put Symmetry X on. 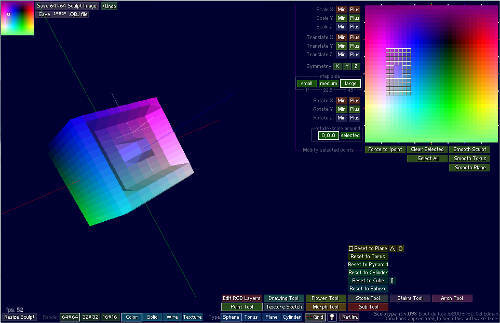 And start to select several points in the Color area. Next I use the Scale X and Z to make the eyes hollow. I press Clear Selected, and start to extrude or make different holes next. Smooth Sculpt, a few times.